RELIEF EFFORT CO-ORDINATOR – Alison Pakula, the owner of Alligator’s Gourmet Grilled Cheese, has been collecting supplies to help support the people affected by the Telegraph Creek, B.C. wildfire. 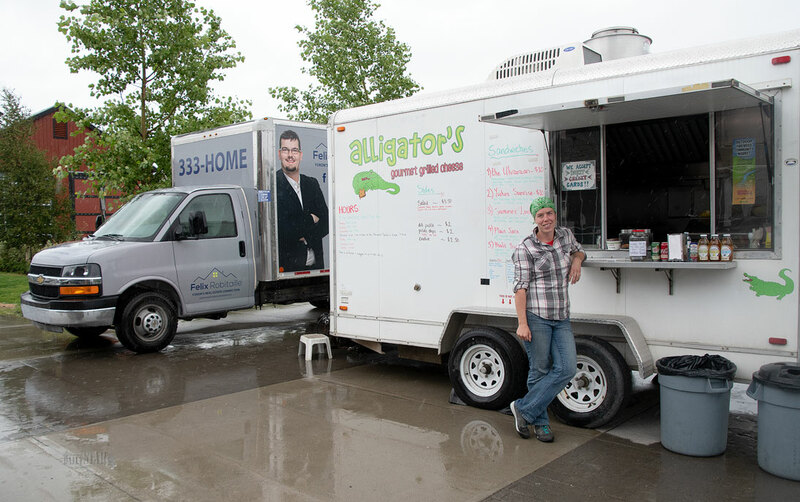 With a call out for help, Yukon realtor Felix Robitaille offered his cube van (left) to transport the goods into northern B.C. A Whitehorse business owner has been gathering supplies for the evacuees of the Telegraph Creek, B.C. wildfire. Alison Pakula, the owner and chef of Alligator’s Gourmet Grilled Cheese, has been taking donations at her food cart in front of the Waterfront Wharf. She has a friend who has been badly affected by the fire, having lost a home. Pakula’s mother also has a place in the area. She said she decided to help out with relief efforts when she realized how bad the situation had escalated. She learned about what happened to her friend last Saturday, and decided to do something on Monday. Pakula is asking for dry goods and toiletries. She had a 16-foot trailer set up next to her food cart where donations could be left. “It was stuff for immediate needs,” she said in an interview today. She was unsure of how many supplies were gathered, but did say two loads were taken from Whitehorse to B.C. One load left Wednesday, and the other left Tuesday. Pakula said there has been a great response from the community. Grocery stores have helped out, and the support is so widespread that Pakula had to ask people to slow down. “The response has been overwhelming,” she said. She said she may gather more supplies. The Telegraph Creek evacuees may have left but the firefighters remain. In their case, she will ask what is needed before putting the word out for donations. She did say items like sunscreen, dry goods and water bottles are always needed. Pakula is unsure if she will bring in another trailer. She pointed out that the Tahltan Central Government is taking e-transfers. The funds will be used to rebuild the community. Her friend has a GoFundMe page set up at gofundme.com/travis-and-heidi-fire-relief to help with her move. Overall, Pakula is grateful that the community has stepped up to help people in need. @Salar, how do YOU know what he does and does not do with his van? Who cares what it is usually for, it is being put to good use now. I think in a situation like this any cube van used would have advertising on it as well. I went down and bought a sandwich...mmmmm Yukon Sunrise....and donated to the cause as well. You? Alison is legit. Felix is looking for publicity...and that's all fine and well but it's opportunistic...and my kids find the truck creepy when we drive by where it's parked all year on 2nd....it doesn't drive seniors around or pick up food for the food bank in all its donating potential...just my opinion..thanks. @ salar, so you trash talk a guy who's donating his van and time to help others...what are you doing to help I wonder ? Eeek, there's that creepy Felix truck again.....but all very sincerely, awesome work Alison!